An Encounter With The Red Giant Flying Squirrel. At Namdapha National Park. It was the last day of an expedition into Namdapha National Park. The three of us – me, Bhaskar and a tribal porter, were about fifteen miles deep inside the mighty forest, and to get to the nearest civilization seemed like a far-reaching dream. But yet, we couldn’t stop – not in this dense jungle. The day had already started on a bad note. We had taken a wrong turn somewhere in the mountains and had gotten separated from the main group. None, from the three of us, knew the way around these very-remote forests. To add to our worries, it had started raining and the terrain had come alive – with the menace of leeches, by the sting of spiky-poisonous plants, and by slimy mud; which was absolutely impossible to walk on. All we had with us, was our instincts for survival and prayers to God. Thankfully, one of us had come to these parts a few years back, and he had a very vague memory of the routes. And when you are lost, anything that sounds like the faintest of possibility, becomes the action to be performed. We kept walking, following our instincts, and after two hours of clueless-roaming around, we found one of the expedition guides waiting for the three of us lost souls. We were relieved to see his familiar face, and so was he to see us. It was quite a momentous moment – to know that we were going to be alive. I felt a deep respect for the forest. That a man is nothing in front of its mightiness. But we still had a long way to go, and it was already quite late. It was on this next phase of our walk, that we came across a sweet little surprise. Somewhere nearby in the river-bed, we spotted something quite huge and mammal-like moving. We went a little closer, only to realize that is was a Red Giant Flying Squirrel that was crawling away from us. The porter asked me whether he should go and catch the cute-looking animal. The opportunity to see this exotic animal up-close was quite tempting and so, I gave my nod to the porter. It was amazing to see the porter run after this wild animal – like the hunter instincts within him had been awakened. I looked at him with wonder, hoping and praying to God that all he does is just catch the squirrel and not kill it. It did not take much time for the expert porter to catch the animal, and upon doing so, the first thing he asked me, was whether he should kill the squirrel. I was shocked to hear his hunting-induced words. Being a wildlife enthusiast, killing this exotic animal seemed outside the limit of things that I do. I boldly told the porter to not kill the squirrel and gave him a good lecture on why it is important to save the wildlife and forests. It seemed to me that he did appreciate my concern for wildlife and the environment, and I could sense a little enthusiasm towards wildlife rising in the mind of the tribal. The squirrel was huge. It looked exotic, had big claws, a long furry tail and a majestic glider that enables it to glide high up in the forest canopy. On closer inspection, we found that it was injured and bleeding. It was not being able to walk properly. I did not want to leave the hurt animal in the middle of this wild forest, as I was sure that it would fall prey to any of the many predators that roam the Namdapha jungle. In the rule of the jungle, an easy catch is always an easy catch. I cajoled the porter into carrying the squirrel back to the camp, where we were headed to. Surprisingly he agreed. And to tell you, there are a very few people in the world who will be up for the challenge of carrying in bare hands, a alive Giant Flying Squirrel for five hours, whilst battling a terrain as rough and difficult as Namdapha. We had rivers to cross, muddy-slippery mountains to climb, leeches were sucking on us, and yet, the porter never gave up. His hands were bleeding from the many cuts made by the menacing nails of the squirrel. I respect such a man – of determination like a unshakable rock. After five more hours of rain-forest trekking, of which three hours was in total darkness, we arrived at Deban, the main camp of the National Park. It felt glorious, to have survived the jungle. We had started our trek at 9 A.M and we reached at 9 P.M. Twelve hours of experiencing the thrilling intensity of life. Thankfully, the squirrel had made it. We handed it over to the officials of the forest department, and they promised to take good care of him. Hopefully, this lucky squirrel is alive and happily nibbling at some juicy piece of wood. And a deep thank-you to the porter, without whom, this story wouldn’t be possible. Bhaskar, taking a little time off. The Giant Red Flying Squirrel. Posing for a snap. 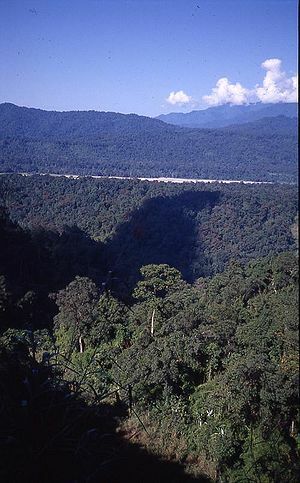 Namdapha National Park, an encounter with the mother forest. … and it is a lovely story. Oh, that squirrel IS big. Nice to hear about this animal. Hats off to you for thinking of saving this exotic squirrel. You’ll hear from me a lot more often, coz I really like coming here. Appreciate your comment Amrit. Kot aso? Don’t you think catching ( ask/allow to catch) that poor thing itself is totally irresponsible behavior.. ?? I am shocked to read your article and see those disheartening pictures. How can some one risk life of the animal just for a sake to see it closely ??? Totally insane and Not acceptable. Mark my words .. if at all you want to see this particular animal upclose … you need just torch light and little patience and you will find it sitting right on your head in the night .. Some times someone’s enthusiasm might prove harmful to the wildlife ..
Apart from catching it , you made it even more vulnerable to the predators which includes human beings by bringing it to camp. I appreciate the comment of a die-hard wildlife enthusiast such as you. You have been on the field for a long time, doing some amazing work, and obviously, you would have much more knowledge than me. I am sorry to oppose your view, but I don’t think that I was risking the life of the squirrel by trying to catch it. Being born in Upper Assam, all my life I have lived surrounded by wildlife, and this has resulted in a deep respect that I have towards nature, which only I would understand. The only reason I caught the squirrel is that I love animals, and there is nothing wrong about that. In the end, all that matters to me is that I had all intentions of setting it free, and in-case you have not read my article properly, the reason I carried the squirrel to the camp was because it was hurt and needed urgent medication. Or else I would have been more than happy to release it back to the forest. Also, I have been to Namdapha quite many a times, and I know a lot of humans who live there, who actually care about wildlife and conservation. If you ever make a visit to Namdapha again, do let me know, and I will introduce you to many tribal people who have a remarkable passion for protecting wildlife. And I assure you that the officials I handed over the squirrel to, were people I know personally, and they did a good job in rescuing and rehabilitating the wild animal back to the forest, where it belongs. But the question here is the disunity between wildlife enthusiasts. There is nothing to judge as far as our love for wildlife is concerned. The fact that we love wildlife and are anti-commercialism is more than enough a reason for us to unite. I believe there are many ways in which we appreciate nature. Some like Steve Irwin have a passion to catch snakes and sting rays, some like messing with crocodiles, some keep dogs as pets, some tribes such as Red Indians are wildlife lovers and yet they hunt as a symbol for respect, some such as you like to photograph birds and animals, some like to study wildlife. We may be different in our methods of appreciating nature but what is common between us is the undying love for nature. Also, I do not appreciate the strong language that you have used while commenting in my blog, words such as totally insane is quite rough and is totally unacceptable by me. If you really care about wildlife, I wish you would write about China and flood all Chinese websites with pro-conservation messages. It is not people like me or the tribal people who are destroying wildlife. To tell you the truth, most of the people in Northeast, including the hunting tribes of Arunachal and Nagaland, we all have a deep respect for nature and wildlife. But it is the demand for animals products in China, which is solely responsible for the depletion of wildlife in Northeast India, more so for Namdapha. If you are interested, I would be more than glad to give you the details about illegal wildlife trading in Northeast India, but only if you promise to do something about it. Thank you for commenting, and I deeply appreciate your concern. P.S – You are an amazing photographer. Had fun going through the amazing pictures you have clicked. regards to ur thought.regards to a great soul. Hey I am so happy I found your weblog, I really found you by accident, while I was searching on Google for something else, Regardless I am here now and would just like to say cheers for a fantastic post and a all round thrilling blog (I also love the theme/design), I don’t have time to browse it all at the moment but I have saved it and also added in your RSS feeds, so when I have time I will be back to read much more, Please do keep up the excellent job. i agree.. that i was lil harsh on my comments.. and sincere apology for the same.. as i hardly lose my mind and comment on such things . i still insist on my views.. and would suggest you discuss it with the experts in the field..
hope you will b in sync with me and million others who care for mother nature and we can together work. well these are just my opinion, suggestions.. no intentions to hurt anyone.. but definitely have intentions for wildlife to not to be hurt..
thanks for your cheerful words about my work. Great Site! Just passing through! Informative! This is a great post, made for a good read. Would definitely like to touch base with you when I head to Namdhapa later this year. I hope the Squirrel recovered well? Thanks for the comment and glad you like the post. Please feel free to touch base if around.